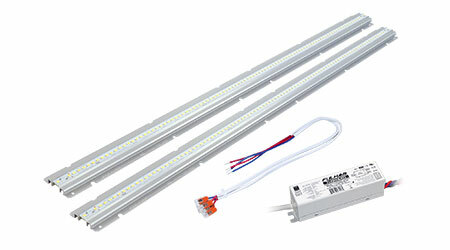 Vizion LinearHO high-output LED retrofit kits to retrofit high-bay, vapor tight, and troffers. All kits in the Vision LinearHO line are high-lumen, high-efficacy units designed to replace and enhance where traditional linear lamps would have previously been used. The Vizion LinearHO kits are available in 22-inch and 44-inch lengths and support universal voltage (120V to 277V) with 0-10V dimming. The kits are also compatible with most of Fulham's LED emergency lighting systems. There are a dozen retrofit kits in the Vizion LinearHO family, including four 22-inch vapor tight and troffer units and seven 44-inch vapor tight, troffer, and high-bay units. They are UL classified for field installation, as well as DLC, which typically requires five to ten minutes per kit. Kits are available in 3000K, 3500K, 4000K and 5000K color temperatures, with 80CRI. They also feature pre-mounted magnets and push-in connectors for easiest installation and are self thermally managed due to their extruded aluminum design. In addition, the kit comes with a two- or four-module harness allowing for ease of installation when connecting the modules to the driver.